On Day One of my Pacific Northwest EVO 4G Tour last Thursday (May 27), I checked out the performance of Sprint’s new EVO 4G phone running on Clearwire’s 4G WiMax networks in the Washington cities of Bellingham, Seattle, Snohomish, and Tacoma. The EVO 4G phone is the first phone designed to run on a U.S. 4G network. The phone has been receiving great reviews; but to get a feel for the phone's capabilities, I wanted to see it in action on a 4G connection, which is said to offer data speeds up to ten times faster than those a 3G wireless data service can deliver. I didn't find this kind of performance in Washington; in fact, I saw only flashes of the EVO’s potential in 4G mode. 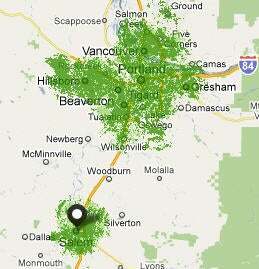 So on Day Two (Friday, May 28), I sampled the 4G service in two Oregon cities: Portland and Salem. Here are my impressions. Click here for information on 4G networks. Click here for descriptions of my testing methodology and of the apps I used. My impressions of the 4G-connected EVO 4G in Oregon were broadly consistent with my experience with the phone and the service in Washington. The Clearwire 4G service (now available in 36 U.S. cities) seemed generally available where it was supposed to be (and then some, as discussed in the Salem section), but the service simply isn't fast enough to turn the EVO 4G into the “revolutionary” communications device it's being hyped as. Don’t get me wrong: The EVO is a truly impressive phone even in 3G mode. What prevents it from being a real game-changer is the speed of the Clearwire 4G service. The speeds I saw in Oregon were marginally better than those I saw in my Washington tests, but still less than the download speeds of between 3 megabits per second and 6 mbps that Sprint and Clearwire advertise. In my Oregon tests, the EVO registered average download speeds of 2.3 mbps. And as in Washington, I never encountered the 10-mbps bursts of speed that Sprint says the Clearwire 4G network is capable of. 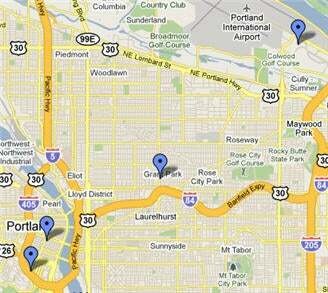 My testing locations in Portland, Oregon (from left to right): Pioneer Square (city center), Portland State University campus, Grant Park, and Portland International Airport. I began testing in North Portland (roughly 4 miles north of the city center) and found that I could not get a 4G signal on the EVO 4G or with the Sprint Overdrive mobile hotspot. Driving toward downtown I noted that 4G service became available roughly 2 miles north of the bridge that takes you into downtown Portland. At the other four locations I tested in Portland, I was able to connect with the 4G network--sometimes immediately, and sometimes after a little tinkering with the phone’s wireless networking settings. At Pioneer Square (city center), for example, I couldn't connect the EVO phone to the 4G network while sitting in the car. But after walking to the center of the square and fiddling with the phone’s wireless settings for a few minutes, I was able to connect. Meanwhile, back in the car, my Sprint Overdrive hotspot connected with the 4G network straight off, and stayed connected for the duration of my tests at that location. I had the same experience at almost all of the 14 testing locations I visited during my two days in the Northwest. On the campus of Portland State, the EVO 4G connected with the 4G network immediately and stayed connected at reasonable speeds (approximately 2.4 mbps) as I wandered around campus. Across the river at Grant Park, however, the 4G signal was noticeably weaker: I had to drive around to the side of the park facing downtown before I could pick up and hold the 4G signal. At the Portland airport later in the day, I had similar troubles. Though the Sprint Overdrive hotspot connected to 4G immediately and at high speed, I had to take the EVO 4G phone outside the car to catch and hold the 4G signal. Pioneer Square at city center in Portland, Oregon. The YouTube video looked relatively good in my tests in Portland--by 3G standards, at least. In my Pioneer Square and Portland State test locations, the video was enjoyable to watch, though I noticed at least a little bit of artifacting, as well as some mild jitter in moments of high motion. The general quality of the video wasn’t as sharp and fluid as high-quality video should be. Watching the same video on my laptop, with the laptop plugged into a wired broadband connection, I saw true high-quality video with no artifacting or jitter--just smooth, fluid picture and motion. As I moved away from downtown Portland to Grant Park across the river and then to Portland International Airport, I noticed that the video quality deteriorated slightly. At Grant Park (in a soft rain), the video took about 10 seconds to start running, and showed some visible artifacting and jitter, especially when the action recorded on the video involved lots of quick movement. I noted the same symptoms while watching video at the airport (also in a light rain) later on in the day, though the video did load much faster there. The Qik live video streaming app continued to give me problems in Portland. At three of of my four testing locations (not counting the fifth location in North Portland, where I couldn't pick up 4G at all), the live video shot by the EVO 4G showed up at the Qik site in a browser running on my laptop after a lag of 5 seconds or more. And after the video finally showed up in the browser, the video often stalled, increasing the delay to between 10 and 15 seconds. Again I marveled at the idea that people might try to use this app to conduct a videoconferencing session between two smartphones connected on the 4G network. If such use is to be practical, the speed simply must improve. Portland State University campus in Portland, Oregon. The positive exception was my test at Portland State. There the real-time video that the EVO 4G was shooting showed up on the Qik site within a few seconds of my pushing Record. The delay grew to about 5 seconds after the video displayed in the browser, however. The Layar app performed well all over Portland. When I instructed it to search for nearby restaurants, numerous “food” symbols popped up on the EVO’s screen. When I searched for tweets nearby, the app seemed to need a little more time to register them. But after a few seconds, blue bubbles showed up over the locations of nearby tweets (with the content of the tweets displaying at the bottom of the screen); and after a few more seconds, the app began displaying the actual profile pictures of the tweeters.